Liverpool have completed the signing of Switzerland playmaker Xherdan Shaqiri from Stoke City. According to respected Liverpool Echo journalist James Pearces, the Reds have paid a £13m transfer fee, while the player has penned a five-year contract. 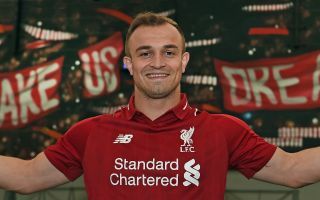 The terms of Shaqiri’s deal have not been officially released but earlier this month transfer expert Ian McGarry suggested the 26-year-old would likely earn £120,000 a week at Anfield. #LFC confirm the £13million signing of Xherdan Shaqiri. He has penned a five-year contract. If the top end of that estimate is accurate, Shaqiri would stand to earn £6.24m each year and just over £31m over the duration of his deal. Earlier this month Mohamed Salah penned a new long-term contract at Anfield, which The Express claimed was worth £200,000 per week. Shaqiri is expected by many to act as Salah’s understudy this season. Both players are left-footed and ideally suited to played on the right side of Liverpool’s attack. Salah won the Premier League Golden Boot last season with 32 goals and also provided 10 assists in 36 appearances. Shaqiri also played 36 games, but delivered eight goals and seven assists.